How do you make a world? This is the purview of theologists, science fiction authors and cosmologists. Broadly speaking, explaining how the universe evolves is no different from any other problem in science: we need to come up with an underlying theory, and calculate the predictions of this theory to see if they match with the real world. The tricky part is that we have no observations of the universe earlier than about 300,000 years after the big bang. Particle colliders give us a glimpse of conditions far earlier than that, but to a cosmologist even the tiniest fraction of a second after the big bang is vitally important. Any theorist who tries their hand at this is left with a trail of refuse models before they reach a plausible vision of the universe. Of course, how and why one does this is deeply personal, but I would like to share my own small experience with trying to make a universe. For me, the end was very clear; I wanted to design a universe that explained the existence of dark and visible matter in a particular way. Asymmetric dark matter is a class of theories that try to link the origins of dark and visible matter, and my goal was to explore a new way of creating matter in the universe. So what do you start with? As a particle physicist, the most obvious (but not the only) building blocks at our disposal are particles themselves. Starting with the Standard Model, the easiest way to build a new theory is to just start adding particles. While adding a new particle every time you want to explain a new phenomenon seems indulgent (and some people take this to excess), historically this is a very successful tactic. 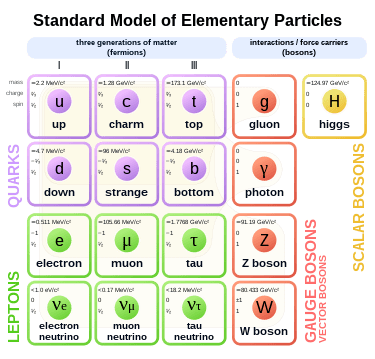 The neutrino, W and Z bosons, the charm, bottom and top quarks, and Higgs boson were all introduced before they were discovered to explain various theoretical or experimental problems. While back in 1930 [Wolfgang] Pauli apologised for the bad grace of introducing a particle no one had ever seen, theoretical physicists have well and truly overcome this reticence. So what ingredients does a dark matter model need? 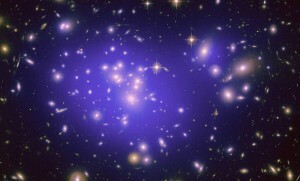 Clearly there must be a viable candidate for dark matter, so at least one new particle must be introduced. While the simplest case is for dark matter to be made of one particle, there is no reason for a substance that makes up 85% of matter in the universe to be any simpler than the matter that we are made of. But, for the sake of simplicity, let us say just one particle for now. For my work to explain the creation of visible matter as well as dark matter, there must also be some interaction between the two. To do this there must be a “mediator”, something that communicates between the visible and the dark. So at least two particles are necessary. Now, two particles doesn’t sound so bad, not when we already know of 17. The model I was originally going to study (one that already existed) was like this, with dark matter interacting with neutrons. Unfortunately, this is also when the realities of model building sank in; it is rare for any model to be this simple and still work as advertised. Under closer scrutiny it turned out that there was no satisfactory way to make the dark matter stick around for the lifetime of the universe – it quickly decayed away unless you made some theoretical sacrifices I wasn’t comfortable making. Thus began my first foray into model building. The first hurdle to overcome, for a first time model builder, is simply the vast size of the literature itself. I was constantly worried that I had missed some paper that had beaten me to it, or had already considered some aspect of my work. Even though this was not the case, even the simplest of possible universes has a lot of complicated physics going on in a variety of areas – and any single aspect of the model failing could mean scrapping the whole thing. Most of these failing points are already known to those experienced in these matters, but a first timer has to find them out the hard way. In the weeks I spent trying to come up with a model worth studying in detail, I had almost a dozen “Eureka” moments, which were almost always followed by me finding a flaw in the next few days. When you have no strict time limits, this is simply disheartening, but occasionally you can find flaws, or potential flaws, when you are already significantly invested and close to a deadline (such as thesis submission). Unfortunately the only real way to avoid this is to develop a level of care bordering on paranoia, to try and think of all the possible ways a theory might implode before getting bogged down in calculations. Of course, some things are inherently unforeseeable (otherwise why is it research) but many can be divined beforehand with enough experience and thought. This was driven home to me after spending a month working out the predictions of a theory, only to discover that I had drastically underestimated the consequences of a minor change to the model. Fortunately in research little is wasted; even though no part of that work appeared in the final version of my thesis, the methods I learnt certainly did. My pride and joy, a model of ADM via a lepton portal. Leptons (like electrons and neutrinos) interact with scalar dark matter (the phi) to create the matter we see today. Trying to come up with a theory yourself also forces you to confront your theoretical biases – naturalness, simplicity, renormalisability, testability and fine tuning are all considered by theorists to be important considerations, but it is almost impossible to satisfy all of these at once. Even worse, there are often many different competing interpretations of all of these. So, almost inevitably, sacrifices must be made. Perhaps your theory has to give up on technical naturalness, or has a hell of a hierarchy problem (which mine definitely did). That being said, this is not always an issue; many models are made to explore a particular avenue, or to provide a working example. The fact that some of these traits cannot be satisfied is important information. You have to pick and choose what you care about, because if the history of physics has shown us anything, it is that theoretical biases, even very well grounded ones, can simply be wrong. 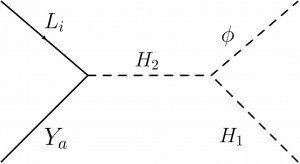 The discovery of CP (and consequently time reversal) violation and the non-deterministic (or the apparently non-deterministic, depending on whether you prefer a many worlds interpretation) nature of quantum mechanics are just a couple of examples where “essential” elements of a proper theory turned out to simply not apply. While this seems like a frustrating experience, I actually greatly enjoyed model building. Too much of university coursework is rushed – you have to learn all of a subject in 12 weeks, and are tested in an exam that only lasts four hours, sometimes in quite shallow ways. This kind of research emphasises patience and care, and allows (or requires) you to deeply understand the physics involved. Calculations are irrelevant for a large part of the process. You simply don’t have time to try and brute force your way through dozens of theories, so you must devise more elegant ways to discriminate and choose those worth the time. I very much doubt that the model I worked on is the underlying truth of our world, but it was very fun to try.